I love getting weekend traditions going and every other Sunday or so, we have been having our friends over for Sunday Suppers! Football and beer for the boys, cocktails in the courtyard for the gals, and a great dinner for all of us has been the perfect way to end a great weekend. What's funny about these traditions is I know they never last forever. I can remember so many times in my life when there was always a tradition, and at the time, it seemed as if it would always be one forever - McDonald's meet ups before the big Friday night football game in high school, Tipsey Tuesday nights in college, Thursday night girls night dinners after college, the list goes on and on - but somewhere along the way they stopped. You never know why or how these things stop but they can never last forever. 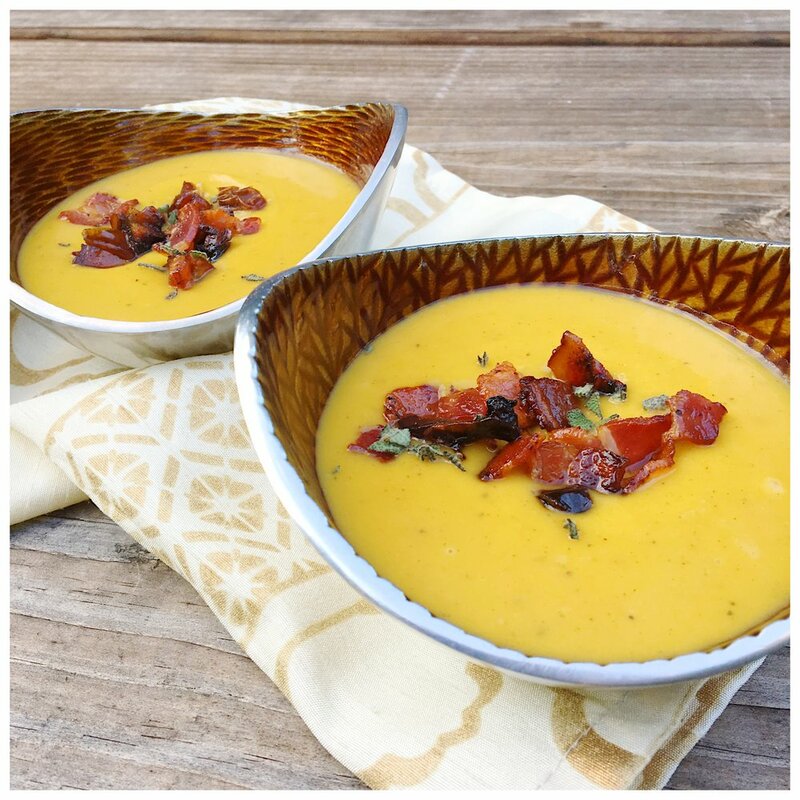 Sunday Suppers may not last forever, but we can always remember them by making this pumpkin soup I cooked last Sunday. 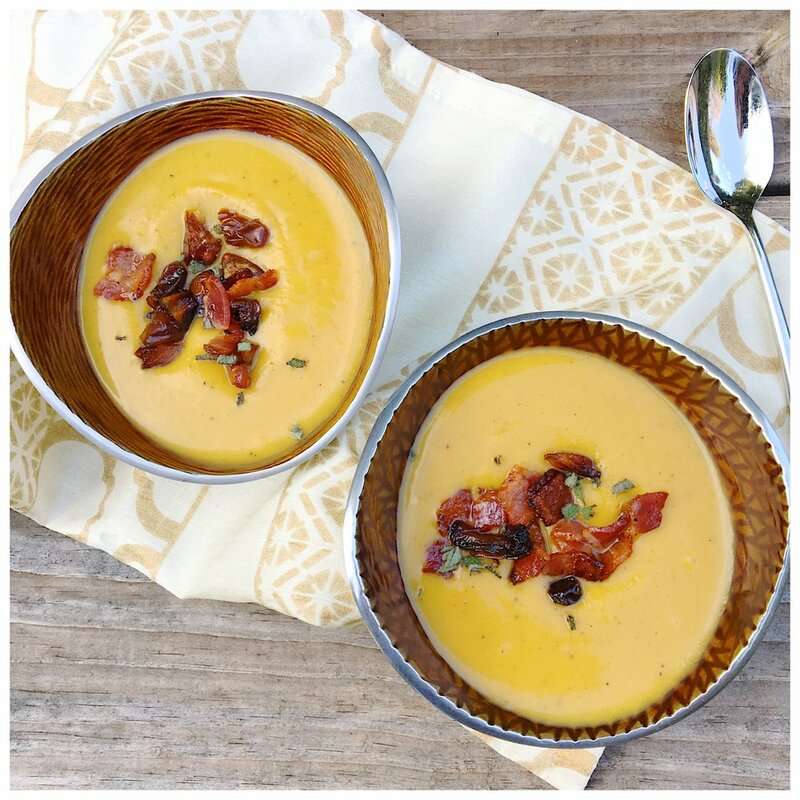 This is one of the most delicious soup concoctions I have ever created, and you'll love it this fall! 1. Heat oven to 400 degrees. Place the pumpkin quarters on a baking sheet, rub with olive oil, and sprinkle with salt and pepper. Place the bacon pieces on another baking sheet lined with parchment paper. Put both the pumpkin and bacon in the oven. Take bacon out after about 10 to 15 minutes or until crispy - be careful not to burn. Bake the pumpkin for about 25 to 30 minutes or until soft. Let both cool. When bacon is cool, mix together in a medium bowl with the dates and set aside. 2. While pumpkins are roasting, heat butter in a Dutch oven or large pot over medium low. Saute the shallots and garlic for about a minute or until shallots are soft. Add the cinnamon, all spice, red pepper flake, and ground ginger and saute for another minute. Add the maple syrup and beer and let beer reduce by half. 3. Peel the skin off the pumpkin then add to the pot, breaking the pumpkin into pieces. Add the chicken stock and heavy cream, stir together, then ladle soup into a blender - you may have to do this in batches. Blend at high speed until smooth. Pour the soup back into the pot over medium heat. If the soup is too thick, add more chicken stock. If it's too dark, add more cream. Taste for seasoning. Let soup heat up then ladle into bowls and top with the bacon-date mixture and more cream if desired.